It was a surprise to UCLA head coach Valorie Kondos-Field to learn that the team she’s been coaching for 37 years achieved a new milestone on Monday night in its meet against Arizona State. The Bruins scored 197-plus in their first three meets of the season for the first time in program history. In her usual form though, Kondos-Field was quick to redirect the focus onto what her team has yet to accomplish. 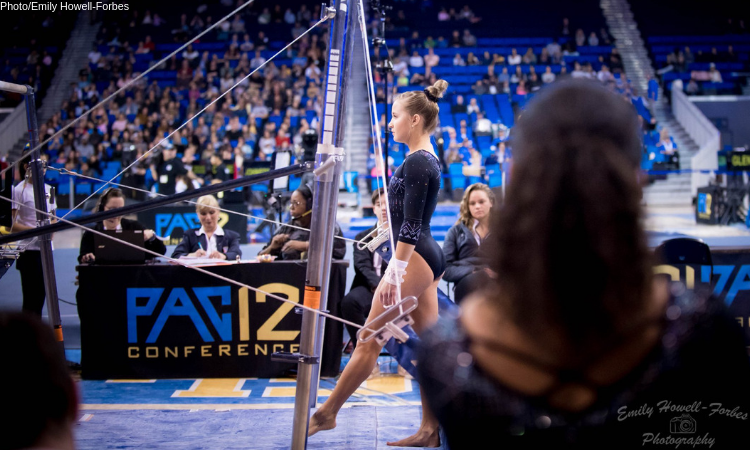 Junior Madison Kocian agreed that the team is still settling in. Junior Kyla Ross had an uncharacteristically poor landing on vault after one hand slipped on her block. Kondos-Field chalked up Ross’ ability to land that vault at all up to her competitive mentality and once again pointed out that mistakes can be a source of motivation for her athletes. The Bruins achieved a season high on bars despite a fall from sophomore Nia Dennis, who went over on her final cast handstand. Kocian, who scored her first 10.000 on bars in almost two years after injuries kept her from her pet event for most of 2018, was a key part of the team’s recovery despite a very recent change to her routine—last week she swapped a Chow in for the Maloney she competed through preseason since she’s typically more comfortable with Stalders than with toe-ons. Echoing Kondos-Field’s comments, Kocian said that following a fall only made her more driven. The Bruins are adamant that they’re not putting pressure on themselves to win a championship just because of Kondos-Field’s impending retirement. While Kocian got a little more sentimental than others so far this season, saying she was hoping to “take in every moment with Miss Val” through the year, she joined the (no doubt coach-supplied) refrain that she’s taking the season week by week and trying to improve a little each meet. Kondos-Field was a little less coy about her aspirations for her last year.